I don't know why but it seems to me that the difference in price for gasoline between the cheaper and more expensive stations has gotten larger lately. Its not uncommon for me to see a 20¢ to 30¢ difference between gas stations. Back when gas was closer to $1 a gallon it would have been unheard of to see a station charging 30¢ more and the differences between stations generally ran 10¢ or less. A few times lately I've been faced with the decision the decision of paying more for gas or looking for cheaper alternative. My wife and I took a trip to Vegas recently and I had to fill up the rental car. I stopped at the nearest station I found and filled it up. If I recall right I paid about $3.05 a gallon. Unfortunately the station I stopped at was very close to the Vegas strip and was a higher priced station. The price for gas in Vegas is generally a bit more expensive if you're in the high traffic area around the Strip. I probably paid 20¢ per gallon too much. That was a $2-$3 mistake. Oops. Another time i was traveling last week while taking a trip after the 4th. We were in another nearby city and gas was pretty expensive compared to home. Most stations there were charging over $3. I knew gas at the Costco was $2.76. I decided instead of filling up at the $3 station I'd just put in a few gallons to get myself home. If I filled up the whole way I'd be paying about 25¢ more x 14 gallons or about $3.50 extra. I instead put just 4 gallons in which was enough to get us home. Waiting to fillup at the cheaper gas station saved us about $2.50 total. Latest example was just earlier to day. I was running low on gas today and I saw a gas station nearby selling gas for $3.09. I knew that I'd recently paid only $2.76 at Costco for gas but since I was running low I was tempted to just fill it up to be safe. I don't like running the car on close to empty since I might run out of gas and end up stranded somewhere alongside a busy freeway or something. But I wasn't that low on gas so I figured I could safely make it back to the Costco. I safely made it to Costco and filled up for over 14 gallons. If I'd filled up at the expensive station downtown I'd have paid over $4.62 more in gas for that fill up. So I effectively saved myself $4.62 by filling up at Costco rather than the more expensive station. This kind of difference in gas prices can really add up. A few cents a gallon may not feel like a big deal but it adds up at $2-$5 per tank. Consider this: If your car gets 20 MPG and you drive 12,000 miles a year (about average for Americans) then paying $0.33 more per gallon of gas will add up to $198 for a year. For a two car family that $0.33 more per gallon will come to almost $400 a year in extra costs. This may be a bit of a worst case scenario, as I'm comparing one of the most expensive gas stations in our area with one of the cheapest. Of course your individual savings will depend on what kind of mileage your car gets, how much you drive and how much gas prices vary in your area. You're probably more likely to see a 5-10¢ difference in prices between most gas stations. But even spending 5¢ more over a year can add up to $60 extra. 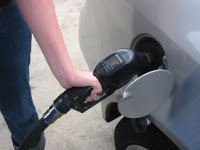 Avoiding the higher priced gas stations isn't exactly rocket science. This is one of those suggestions that seems like straight forward common sense resolved by simply "not doing that". But if you're like me then you've inevitably found yourself in those situations where you feel 'stuck' buying higher priced gas. Some basic tips given below can help keep you on track with this usually easy task. Know the cheaper stations. It shouldn't be too hard to figure out the cheaper gas stations in your area. If you don't know them off hand you could try checking the site GasBuddy.com to see if they have listings. Once you know the cheaper stations then try to stick to them as much as possible. If you're going to be out of town research the cheaper stations in advance. Two of my examples above were when I was out of town and I didn't even know where the cheaper stations were or what the cheaper prices for gas were. Plan ahead. Fill up when you know you are easily able to get to the cheaper station. Don't just wait until you're out of gas and then get yourself into a situation where you have to take the nearest gas station or fear running out of gas. Doing so will cause you to settle for high priced gas more often than not. Don't fill up all the way with expensive gas. If you do need to fill up at a high priced station then just put in a few gallons. I'd rather spend 30¢ extra on 3-4 gallons than on 15-20 gallons.